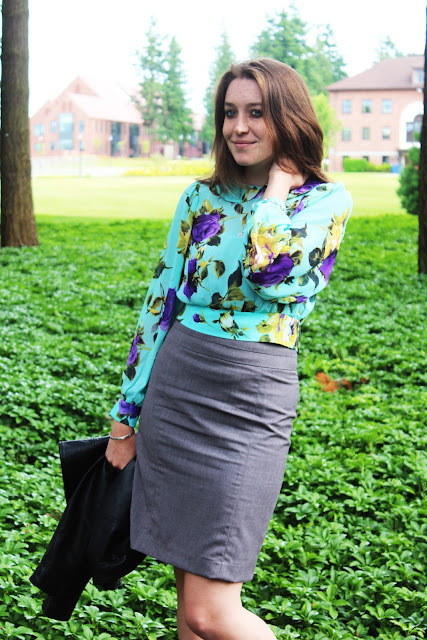 Top: Ruche; Skirt: H&M (similar); Shoes: JC Penney; Bracelet: Tiffany & Co. 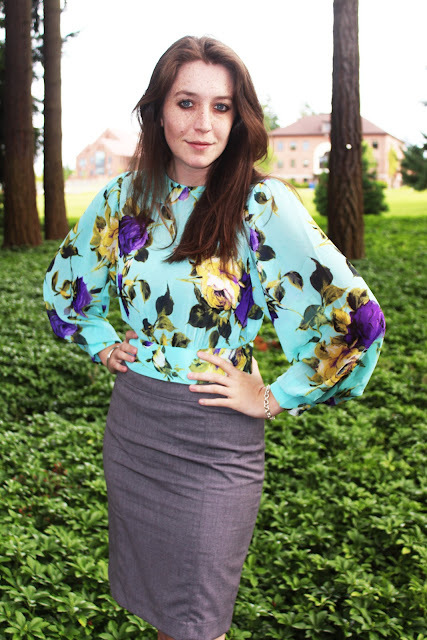 I recently bought this beautiful floral top from Ruche and struggled with how to wear it. It's particularly short, has a peter pan collar and flowy sleeves, and was difficult to pair with anything in my closet. And then I tried it with this pencil skirt and totally fell in love. It's a keeper and I'm glad I was brave enough to keep trying to make it work! CP and I are begrudgingly back at work this week, but getting back to our regular photos and blogging is making the transition decidedly less awful. Though I think we're both just ready to retire from our day jobs and be independently wealthy bloggers from here on out! In some more exciting news, we're hosting a giveaway courtesy of Shabby Apple! You could win a $50 gift card to anything you want at Shabby Apple, including gorgeous sterling silver jewelry (like the necklace to the left that I actually just ordered), cute beachy dresses and gorgeous shoes! We're thrilled that Shabby Apple offered to host this giveaway and hope you'll visit their site to check out some of their gorgeous items! Enter below through RaffleCopter! *Open to U.S. residents only! My fav item is the Serenade dress! That blouse is eye-catching. I'm glad you found a way to style it as the whole look is beautiful - and unique! I visited Shabby Apple and really love the yellow Bistro Blouse! That blouse is so pretty! I love how you wore it! The Red Queen Dress for sure. I love it! And that top is so amazingly perfect on you. I'm so glad you found a way to wear it! I love that shirt, really beautiful. ¡hello! thanks for your coment in IFB! Im following you. I invite you to visit my blog and follow me back. I love, love the Overboard dress!! One favorite is the I'm Late! I'm Late! dress. El Capitan! It's gaw-jus. Thanks so much for hosting the giveaway! love the I'm Late dress! This top is amazing!! Love it! The Dressage dress is pretty. It's romantic and office-appropriate at the same time. Thank you for the giveaway! Favorite item is the Bon Voyage dress! I absolutely love the Hyannis skirt!! And the Race Point one is super cute too. I'm very happy I found you guys and that I entered this giveaway. I'd never heard of Shabby Apple before, and I'm so glad I know about it now. They have adorable classy and retro pieces that are sure to bring many compliments my way! I love the Bali Hai! My favorite is the Bernini dress!